Overnight Oats – a healthy breakfast for porridge haters! « let's talk! 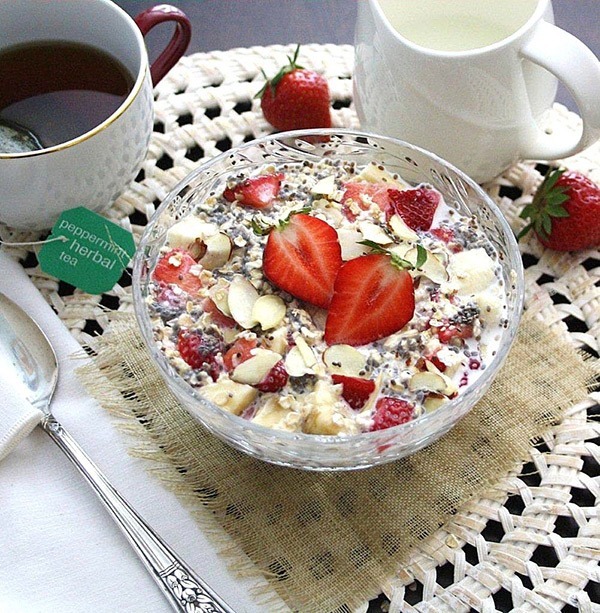 Overnight Oats – a healthy breakfast for porridge haters! We have all heard about the benefits of porridge. The oats are high in fibre, which fills you up, and the complex carbohydrates they contain are digested slowly, releasing energy in a way that keeps your blood sugar levels steady (unlike the simple carbs in sugary cereals for example, which give you a quick energy boost that dissipates swiftly, making you more hungry). They can help you lose weight as part of a healthy diet and there is really nothing about them not to like. Or is there? Porridge is, frankly, not to everyone’s taste. It doesn’t matter how good they are for us, or how it is served up – with honey, fresh fruit, water instead of hot milk for example – some of us will always find a bowl of porridge unpalatable first thing in the morning. Hot milk can remind us of childhood breakfasts that are supposed to send us off to school ‘glowing’, or milky puddings, and we certainly aren’t recommending the proprietary brands of oat breakfasts which are often packed with sugar. Here at The Terrace our own lovely Becky has experimented with a new way to enjoy the benefits of a bowl of oats in the morning. Recipes for ‘Overnight Oats’ are now all over the internet, accompanied by fabulous pictures and serving suggestions. Presented in jam jars, surrounded by flowers and fruit, they are miles away from what some see as a stodgy breakfast. For example, the ‘Eat this!’ site offers 14 recipes, including chocolate peanut butter oats, carrot cake oats and strawberry chia, that look almost too good to dip a spoon into. All it takes is a few minutes the night before you want to eat them to mix together the oats, the toppings and the liquid you want to use and pop them in the fridge. You don’t even need to cook them the next morning as all the flavours have soaked into the oats, although you can add more liquid, or natural yoghurt for example. Becky has her own favourites. She suggests you soak porridge oats overnight in the fridge in something like milk, water, coconut milk or yoghurt. 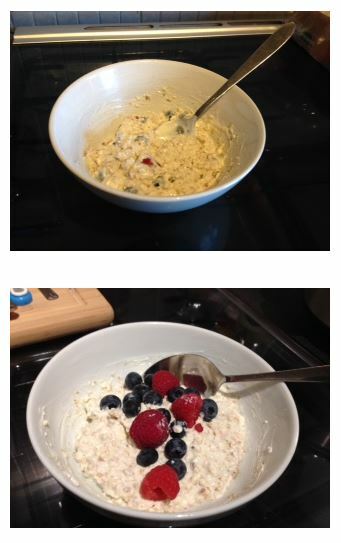 In the morning she mixes in full fat Greek yoghurt (which she finds works better than low fat options), blueberries, raspberries and a linseed mix with chia seeds and goji berries. She has taken her own photos for us – not prettied up but looking delicious nonetheless! So give them a try, especially if you are not a fan of porridge recipes, and if you have any ideas of your own you would like to share we would love to hear from you! This entry was posted in healthy eating, Recipes, Well-being and tagged breakfast, healthy eating, Oats, Overnight oats, Recipes, well-being. ← Action for Happiness – will it work? We have to try…. Its quite an addiction now! I had it for breakfast today but could quite easily have it for lunch too!